Panama’s National Bird—The Harpy Eagle—the largest, most powerful eagle in the Americas. Found in the lowland rainforests of Tropical America, this mighty forest eagle is on every birder’s wish list! It is easily identifiable by its massive size, which separates it from all other raptors in these tropical lowlands. It has a long, divided crest on its head, often swept back but readily held erect and often blows around freely in the breeze. These neotropical raptors are built for life inside a forest—broad, relatively short-winged (despite 2 meter wingspan! ), with a long, banded tail that acts as a rudder to maneuver through the forest canopy. Adult Harpy Eagles have gray heads with crest, uniform dark charcoal gray upperparts, broad black chest band, white lower breast and belly and fine black barring on legs. Juveniles and immatures are generally light gray all over, with varying degrees of gray on back and wings depending on age and stage of molt. It takes 3-4 years for a young Harpy Eagle to attain full adult plumage, and reach sexual maturity around 5 years of age. Harpy Eagles have very strong bills and very robust tarsi and toes, key features to help distinguish it from the Crested Eagle, another large eagle which shares the same range and habitat as the Harpy Eagle. Crested Eagles are overall smaller and lighter built, with single crest, and has 2 color morphs (light morph and dark morph) but never show black chest band. Long talons allow Harpy Eagles to catch their prey – medium-sized mammals including sloths, monkeys, tamandua, iguana, coati, agouti and even porcupines make up their diet. Most prey is taken in the canopy of the forest, but at times, these neotropical raptors will descend to the ground and catch terrestrial prey like agouti, peccary and even small deer. The Harpy Eagle’s hind talon is 8-10 cm (3-4 inches) in length, the same size as a grizzly bear claw! Males and females are distinguishable by their size; female Harpy Eagles are significantly larger than males. The Harpy Eagle is 1 meter in length and has a wingspan of 2 meters long. The main difference is by weight; males weigh 4-4.8 kg (9-11 lbs.) and females weigh 7.6-9 kg (16-20 lbs.). Females can weigh over 2x more than their mate! Harpy Eagles require mature forest and intact habitat to survive. They forage in the upper strata and canopy of the forest. These neotropical raptors are occasionally seen in semi-disturbed habitats, forest edges and riversides provided there is enough food for them to eat, but require mature secondary or primary forest for nesting. They are solitary and monogamous and mate for life. A Harpy Eagle pair maintains a home range up to 25km2. When it comes time to breed, a pair will construct a nest in the crown of an emergent tree, in some areas up to 50-75 meters tall! Nests are typically placed in the crown 21-41 meters above the ground, and the tree must have at least 3-4 large principal branches for suitable use. Throughout their range, several different species of trees are used including the Kapok (Ceiba pentandra) and Cuipo (Cavanillesia platanifolia). Both sexes take part in the nest building process; they seek out large branches, grab them with their feet and with their powerful wings, flap until the branch snaps off. Over 300 branches are used to construct the nest, which is over a meter wide and nearly a meter in height. Harpy Eagles also bring green sprigs to the nest, especially during the incubation and rearing stage. Use of leafy green branches is thought to act as a natural insect repellent and anti-parasite aid. The female will typically lay 2 eggs, and a clutch of 3 has even been reported; however, in almost all cases, only 1 chick is raised. Laying 2 eggs is thought to be a ‘back-up’ in case something happens with the first egg. After the 2nd egg is laid, the female begins incubation for 56 days. During this time, the male will hunt and bring food to her, and occasionally incubates the eggs, relieving her to eat. Harpy Eagles are devoted parents: when the chick hatches, the female feeds the hatchling almost exclusively and the male is responsible for hunting and bringing prey. As the chick grows, both male and female hunt and bring food to the chick. The young bird fledges at 4.5 to 6 months of age, and will stay at the nest site for up to 12 months, remaining dependent on the adults for food. Due to this slow reproductive rate, Harpy Eagles breed only every 2-3 years. Some pairs reuse nests year after year while others have several nests they rotate through year to year. Despite their large size, these neotropical raptors can be very challenging to find in their dense rainforest habitat. They often remain still in the canopy of the forest, and are not overly vocal; they tend to vocalize the most when nesting to communicate between the pair and young. Visiting a known nest site is one of the best ways to see a Harpy Eagle. The lifespan of Panama’s national bird is estimated to be 30-35 years in the wild. 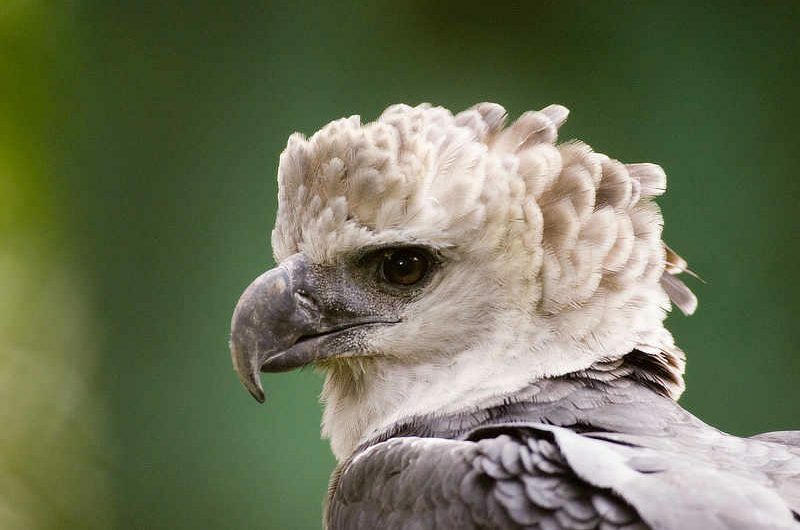 Although rather rare throughout its range, the Harpy Eagle is listed as Near-Threatened (IUCN Red List) due to its large range from southern Mexico to northern Argentina. The populations are in decline due to habitat destruction and direct persecution, and Harpy Eagles are already extirpated from many areas of its former range. The largest breeding population of Panama’s national bird is in Darien, eastern Panama.